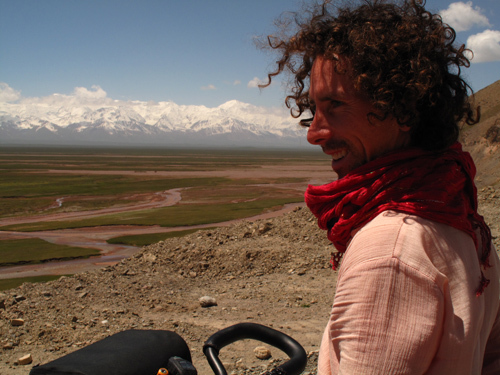 As we freewheeled down to the city of Kashgar, sun and dust in our eyes, haze in the air, second-largest sand shifting desert to our east, we felt elated to have made it this far. 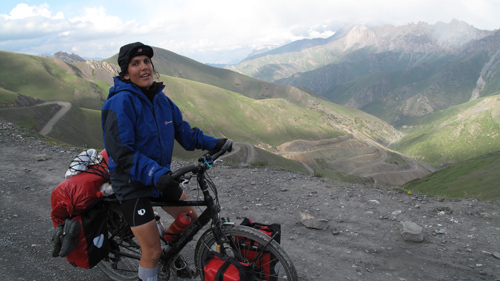 To me, reaching China symbolises having ridden halfway around the world – HOORAY for pedal power! 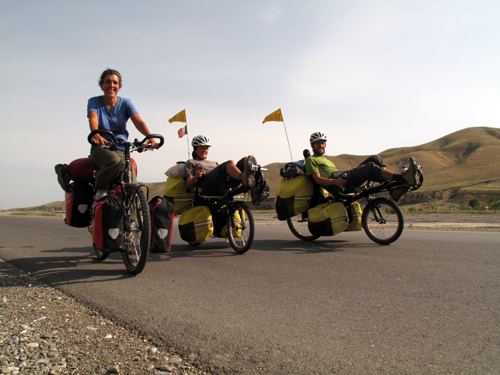 From Osh, Kyrgyzstan, we were joined by two cyclists, Ben and Sylvie, who’ve ridden all the way from France on recumbents. The first 60kms of road was smooth as a runway. But then, as predicted, the roadworks began. Smiling faces greeted us and we learnt our first few words of Chinese, yelling, “Nee-ha” (hello) to all the Chinese road builders as we bumped and clunked along. My forearms and hands ached from the vibrations and corrugations, my lungs stung from the dust of the trucks, but my heart sang with the mountains that surrounded us. 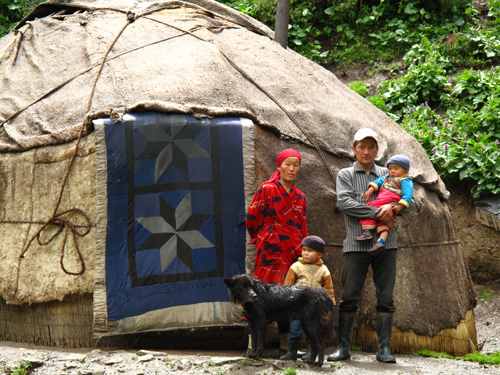 At the end of our second day, we were waved down by a young lad, Timur, who invited us to camp in his back garden. 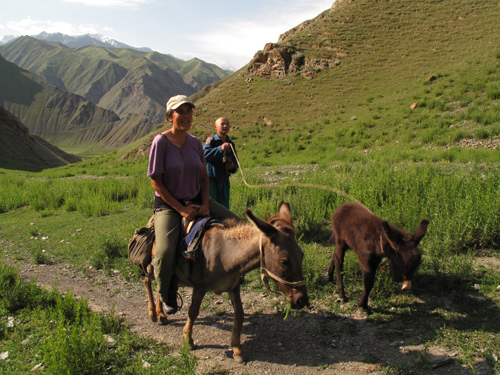 We stayed there for 3 days, swam in the mountain meltwater and visited the jailoos – the summer pastures – riding a donkey! 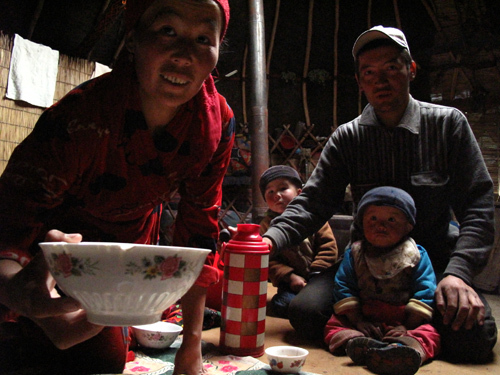 …and plied us with yoghurt, hard balls of cheese, green tea, fresh cream, nan bread and… fermented mare’s milk, a Kyrgyz specialty, known as kummuz. Crossing the 3615m Taldyk Pass wasn’t half as difficult as I had imagined (I’d been creating a nightmare road based on what all the cyclists in Osh had described). As we climbed higher and higher, a cold flutter of snow greeted us. Dan sped ahead, strong and sure, I was slower, having to stay in Granny Gear. This was not because of a steep incline, but because my gears were becoming more and more jammed. Ben and Sylvie had a near collision with a speeding truck, which hadn’t judged the angle of the hairpin bend. The air was thin at the top, and I was breathless but happy. And when I looked back at where we had come from, I was quite impressed. 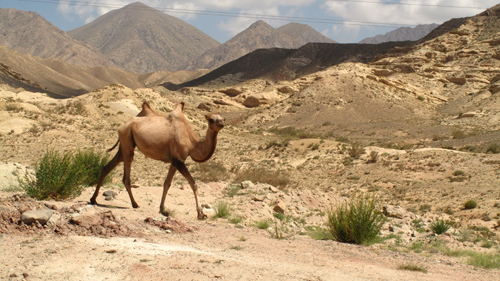 And 250kms later, we were in China, where the stinking floppy-humped camels, the wind-sculpted rocks and the mud-brick Uighur settlements kept us constantly surprised. China has seemed so elusive, so far away for so long, and yet now its snow-capped peaks are beckoning us, inviting us, challenging us. These grand mountains bring tears to my eyes – their presence and strength remind me of my own eternal nature. 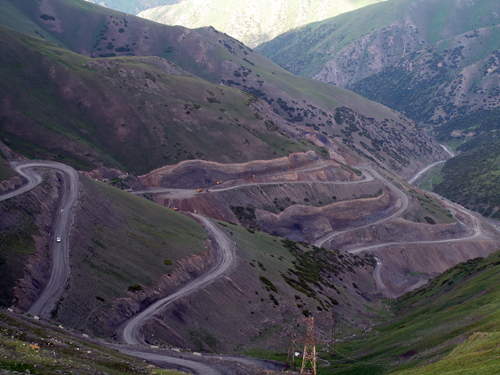 From Osh, a road winds its way into the Alay Mountain range. We’re gonna follow it for some 250 kilometres, crossing three high passes, to reach Irkeshtam, the border with China. I’m a bit nervous cos we’ve met a stack of other cyclists here who’ve reported that this particular road is the worst they’ve ever ridden. 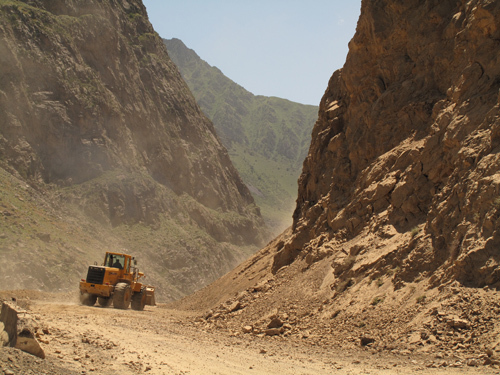 Its whole length is currently under construction, and by all accounts, apart from the first smooth and tarmacked 60kms, it’s rubble, mud, diggers, sand and gravel all the way to China. 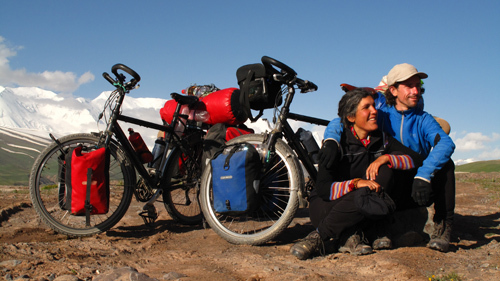 I hope my bike will last until we reach Kashgar. It’s creaking and groaning from within the front hub and the gears have some unsolved problems that elude even Dan. And neither of us know how we’ll deal with the altitude yet – the Taldyk Pass is at 3615 metres – and is the highest we’ve been on bikes. But, one pedal at a time, and I’m sure we’ll get there. Good news! Since January of this year Rainforest Rescue has planted 10,000 trees on previously cleared land inside the Daintree National Park in far-north Queensland. Also, on 13 May 2009, Rainforest Rescue purchased Lot 29 Cape Tribulation Road in the Daintree! This is the 11th property in Rainforest Rescue’s Daintree Buy Back and Protect Forever Project – identifying and purchasing precious rainforest at risk of development and establishing Nature Refuge status, which protects it forever under covenants ratified by the Queensland Parliament in Australia. Owning this 11th property not only means that the unique rainforest flora here, including the impressive fan palms are safe, but rare and endangered species like the Bennett’s tree kangaroo and cassowaries now have a vital corridor through the rural residential subdivision from the Daintree National Park on its northern side to two declared Nature Reserves in the south. This is particularly important in this area, as residential development fragments essential cassowary habitat through clearing and the introduction of weeds and dogs. Unlike the properties to the south of the adjoining road, which are in wet lowland areas, Lot 29 runs up the side of the foothills of the Daintree National Park, offering a significantly different ecosystem especially worthy of conservation. The vegetation type here is described as notophyll to mesophyll vine forest with significant numbers of fan palms on the slopes with the main emergent being the swamp mahogany — host to the rare redeye butterfly and bottlebrush orchids. The biodiversity values of this ecosystem type are described as being ‘very species rich’. As a dedicated Nature Refuge, no development is possible at all now on this property; no dogs, no traffic, no clearing, nothing. Just nature doing what it does best (under the watchful eye of biologist and Conservation Manager David Cook). You can visit this and other properties we have secured on a self guided tour, Rainforest Rescue can give you directions any time. Your continued support is vital in keeping up the momentum on this project. Please help secure even more of the Daintree by making a donation to Rainforest Rescue. Osh is situated at a major travellers crossroads – if you go south-east you reach China via the Irkesham Pass, south will take you to the Pamir Highway in Tajikistan, go north and you will reach Kyrgyzstan’s capital Bishkek and just a few kms away to the north-west is the border with Uzbekistan. All very nice cycling territory! And it’s here that we’ve met NINE other cyclists! Yee ha! Together with our new two-wheeled friends, we’ve been discussing routes and plans and ideas for the way ahead. It’s becoming more and more apparent to us that the original route we wanted to take – along the high altitude Tibetan Highway to Lhasa – is virtually impossible this year. 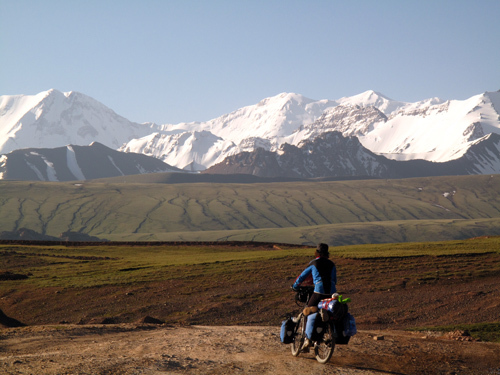 Travellers and cyclists reaching Osh from China have reported that the Chinese authorities have clamped down EVEN more strongly on independent travel through this region since the Olympics. And for the past couple of months, travellers have been forbidden to enter Lhasa without an official guide. 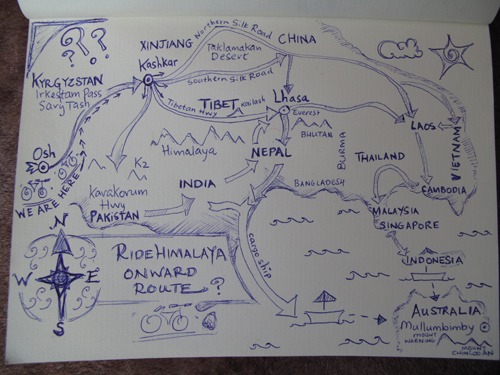 So we’re reconsidering our route and here are the possibilities.